1) Bring 500ml of water to the boil. 2) Add 20g of flakes. 3) Let it sit for 1-2 min until the flakes sink to the bottom of pot. Strain off the broth, using paper towel line sieve. 4) Dashi broth is ready to use for miso soup, noodle soup etc. *Adjust water according to preference. **May contain small fish bones. Store in a cool, dry place away from direct sunlight. Once opened, store in an airtight container, keep refrigerated and consume as soon as possible. Ingredients: Dried and Smoked Skipjack Tuna Flakes. 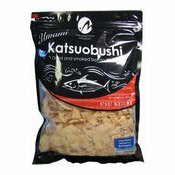 Simply enter your details below and we will send you an e-mail when “Dry Bonito Flakes (Katsuobushi Thin) (鰭鮪魚)” is back in stock!